If junk and rubbish are mounting up at your place, pull the handbrake and call us in. We have a zero tolerance policy toward commercial and residential property waste and will get rid of all the rubbish quickly, affordably and efficiently. Our specialised junk removals in Harrow are available to both private and business customers throughout the borough. We can perform clearances for homes, offices, retailers, eateries and manufacturing facilities. We also offer a sustainable, ecofriendly alternativeto other junk removal and disposal methods as we reuse and recycle as much waste as possible. Diverting some waste from ending up in landfills is a good start in sustainable living. We come across all sorts of waste, some of which is still usable and in good working order, such items are given to charities so they can be of assistance to someone else who is in need. Items and materials which can be recycled and reused are transported to the respective waste processing facilities where they are given another go at life as bottle caps or tin cans. Customers can request a valid waste transfer notice issued by the waste processing plant. Hazardous waste is all volatiles, corrosives, explosives, toxic and radioactive materials, bio waste etc. Our junk removals n Harrow are the sensible way to dispose of waste without paying steep prices or having to wait around to be serviced. The London Borough of Harrow is situated in the northwest of the city. Formed a little earlier than some of the other constituencies, Harrow has preserved the image of an affluent, leafy residential district, featuring some seriously high house prices. The place to be in Harrow is the so called main hill – an area where house prices can gravitate around million and half pounds. 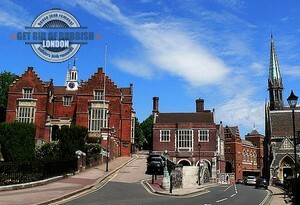 Perhaps the reason why Harrow has retained its affluent image is the presence of Harrow School on the main hill. Generally though, Harrow’s hilly zones are now surrounded by typical northwest London suburbia. We are the most sought after junk removal company in Harrow, HA1, because we are at the disposal of our clients, 24 hours a day, 365 days a year, including on national holidays. Don’t be hesitant to use contact us at a day and time that best suits you as we maintain a round the clock customer support centre. Our consultants are knowledgeable and helpful professionals who will gladly answer to your questions, assist you with the booking of our rubbish disposal options and present to you, your personalised and free quote. As you have already understood, our company operates throughout the Borough of Harrow. The area has an estimate population of 250.000 residents according to the latest census and a density rate of 13.000 people per square mile. The Hive Stadium is the notable sporting venue in the borough. It was opened to the public in 2013 and is currently the home ground of the Barnet Football Club and London Bees.